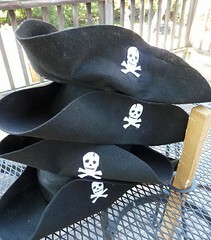 I made up these hats for Talk Like a Pirate Day Canoe and Pudding Hash for MO-A2H3. They turned out much better in the end than I though they would. Just remember to use fabric glue to apply the skull because regular old white craft glue will come off when the hat gets wet; not that any vessels were boarded, pirated and tipped or anything! 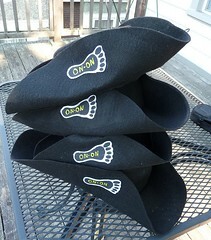 I found some simple directions for making a tri corner hat and went from there. I did keep trying to make the top or cap part fit better, but I finally decided that the best way was to use simple circles and leave it at that. After all the fabric was like $2 maybe. The foot was created by cutting out the foot form then using a stencil with acrylic paint to fill it in. After it dried I used puff fabric paint to write ON-ON. The skull was created the same way basically.